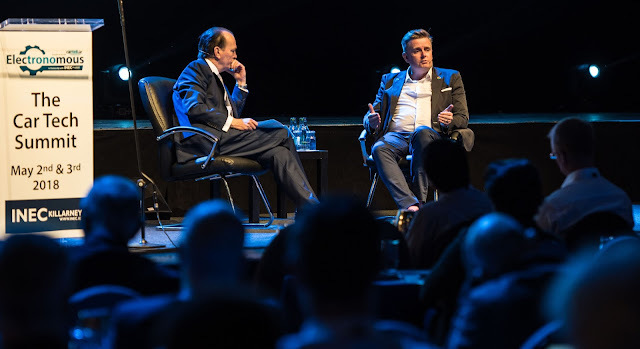 Top people from the Irish and international motor industry are in Killarney for two days of discussion centred on electric vehicle technology and trends, and the progress towards the autonomous car, writes Brian Byrne. The event in the Irish National Exhibition Centre is hosted by Cartell.ie, the vehicle information specialist, with MC being former Top Gear presenter Quentin Wilson. The speaker list included top executives from Ford's research and development headquarters in Aachen, Germany; telecoms and connectivity specialists Nokia; electronics and automotive systems giant Bosch; EUCAR, the European Council for Automotive R&D; Applegreen; Nissan Ireland; the Norwegian EV Association; the Electric Vehicles Division of Nissan Europe; Volvo Cars; and the Valeo automotive technology company. Corporate partners include First Auto Finance, Nissan, SEAI and Start Monday automotive industry recruitment. Among the early speakers was Barry Napier, CEO of Cubic Telecom,who talked to Quentin Wilson (above) about the work of his Dublin-based company which has developed a Global Cloud Platform that helps the world's leading automotive, PC, telecom and retail brands connect and monetise their devices. The Electronomous Car Tech summit continues today with a full day of presentations and discussions. As part of the event, Cartell.ie organised a 'road trip' of a variety of electric cars from Dublin to Killarney, led by TV3 presenter Kirsteen O'Sullivan.